The move by Apple does the same thing to Google as what happened to Facebook as a result of its violation of the terms of the developer certificate. Now, both companies can no longer run or execute internal apps on iOS devices, in this case designed for inside Google's walls. The company used the same certificate that Apple has revoked to distribute the Screenwise Meter app. 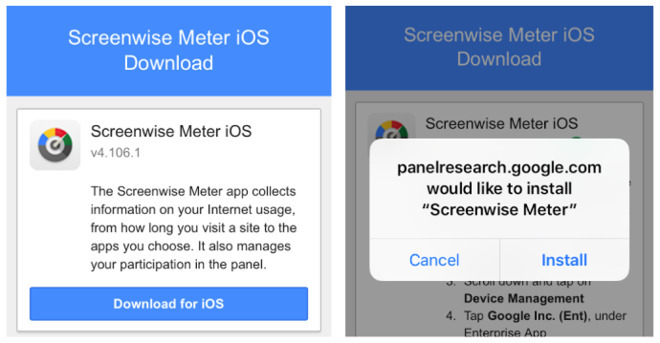 Much like the Facebook Research app that earned Facebook an enterprise certificate ban yesterday, Screenwise Meter handed out gift cards in exchange for Google monitoring a user's web traffic and data by installing a VPN app. Just as with Facebook's app, Screenwise Meter is sideloaded onto the iOS device with an Enterprise Certificate. The difference between Facebook and Google's approaches was that Facebook was shut down by Apple before it had a chance to shut the service down itself, and Google shut down Screenwise Meter before Apple had the chance. Additionally, Google apologized explicitly to users, and Facebook did not. Google issued the apology on Wednesday. The Screenwise Meter iOS app should not have operated under Apple's developer enterprise program. This was a mistake, and we apologize. We have disabled this app on iOS devices. This app is completely voluntary and always has been. We've been upfront with users about the way that we use their data in this app, we have no access to encrypted data in apps and on devices, and users can opt out of the program at any time. Sources inside Apple corporate not authorized to speak on behalf of the company told AppleInsider on Wednesday that Google's action was "being talked about today upstairs" referring to conversation by executives. The certificate revocation was executed at around 3:30 p.m. Eastern Time, according to our sources inside both Apple and Google. Similarly to Facebook, apps impacted inside Google are all versions of consumer apps in testing, carpooling coordination, internal messaging services, and a few others. Google is less impacted than Facebook, according to AppleInsider sources inside the search engine giant, because of the company's obvious Android focus. Under Apple's rules, the Enterprise Developer Certificates are meant for use within a company and not for public usage. To push apps out to the public, developers must either put it through the App Store, which has stringent privacy rules that must be obeyed, or offer it as part of Apple's TestFlight beta program, though that has a maximum user count of 10,000. Google has issued a statement to AppleInsider and other venues, saying that "we're working with Apple to fix a temporary disruption to some of our corporate iOS apps, which we expect will be resolved soon." Likewise, Apple in a statement to BuzzFeed's John Paczkowski said it is "working together with Google to help them reinstate their enterprise certificates very quickly." Facebook's certificate revocation has not been restored, so it is unclear what timetable Google is expecting for recovery.